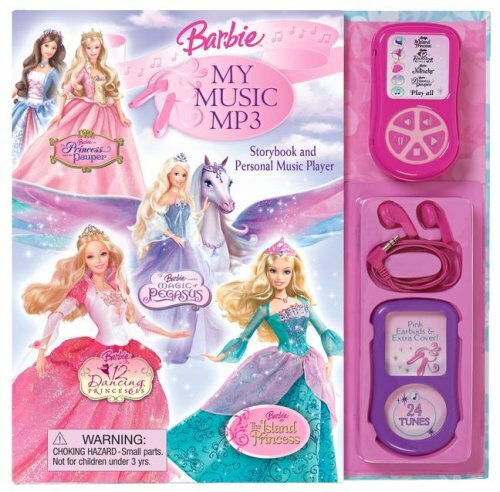 Combine today’s popular music player craze with stories starring Barbie, and you have hours of fun entertainment. Girls will love carrying the hot pink Barbie MY MUSIC or clipping it to their belts, pockets or backpacks with the very cool pink earbuds as they listen to the songs and read all about their favorite pink princesses. The book features four stories—The Island Princess, The Magic of Pegasus, The Princess and the Pauper, and The Twelve Dancing Princesses. Before they read, girls can put on the ear buds and plug them into the music player. Then, following the numerical prompts in the book, they can play one of the six romantic songs for each story (24 in all) that ties into the story. After they are done reading, girls will want to take this awesome music player everywhere. It comes with a slide-on clip so it can be worn on belts, pockets, or backpacks. Plus, there is an extra cover that girls can use to personalize their music player. · Includes: music player with 24 pre-loaded songs and pink earbuds plus extra snap-on case. · Prompts throughout book so kids play songs related to story. The last story prompts for all of the songs to be played.